This weekend I escaped London to enjoy two of my other hobbies: hiking and photography. 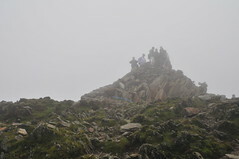 This time I headed to Wales to climb up the 1085 meter high mountain Snowdon; Wales' highest peak. As opposed to staying in Llanberis, the town closest to many of the routes up Snowdon, I stayed in the little quiet town Caernarfon. Or rather, in the B&B Tal Menai not too far away from it. If you get there by bus though, make sure you don't get off on the one that's just a stop too far, because there is no way you can walk along the road. We ended up backtracking over a cycle path. 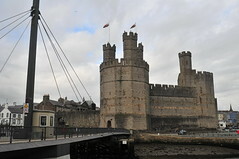 Caernarfon has a pretty nice castle and also a bit of town wall still. It's otherwise not very interesting but they do have a non-floating floating restaurant. As it's on the Menai Strait there are some pretty sunsets however. There are several tracks up to Snowdon, also from different starting points. Our starting point was the Pen-y-Pass parking place at 359 meters above sea-leavel. From here on we went up the Pyg track to the summit. Unfortunately, the Welsh weather was doing it's normal thing: clouds. Which means we saw nothing of the view once we got to the summit at 1085 meters high. Basically, the view was the one that you can see here on the left. After tea and some snacks, we headed back down. And as soon as we did the clouds cleared up showing us the view that was denied us on the way upwards. We took the Miners track back to the parking place to take the bus back to Caernarfon for a very welcomed proper pub meal. I think I would like to go back once more, to try some of the other tracks. The Crib Goch one is supposed to be a really nice ridge walk; unfortunately it wasn't marked on the rendered OpenStreetmap at that point (it is now of course). To see all the pictures, please visit my flickr set "Snowdon".